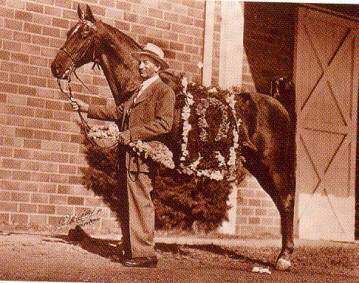 The great Stonewall King: 1920 chestnut stallion. 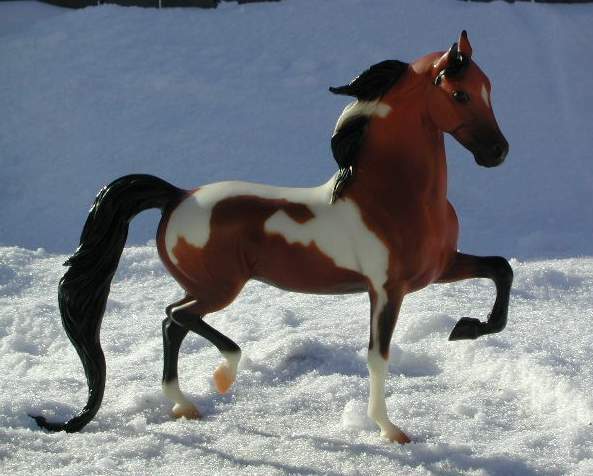 Known most for siring Stonewall Peavine and Stonewall Supreme along with many other outstanding stallions. CH Belle Le Rose: 1927 bay mare. 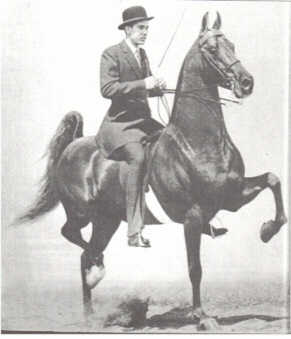 1933 & 1934 5-Gaited World Grand Champion. Beat Sweetheart on Parade(2nd) and CH King's Genius(3rd) in the famous 1933 Championship match at the Kentucky State Fair. Most known for her daughter Rita Le Rose (by Beau Peavine). CH Valley View Supreme: 1952 chestnut stallion. Known most for siring the immortal World Champion sire: Supreme Sultan. Lines to CH Valley View Supreme, CH Wing Commander, Kalarama Rex, CH King's Genius and Stonewall King(2x). 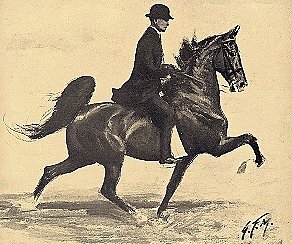 OF Grand Champion Akhal-Teke Stallion "Bronze Baron"
OF Grand Champion Morgan Stallion "Tried & True"
Lines to CH Wing Commander, Stonewall King(2x), CH King's Genius, and Mountain Peavine. Lines to CH Wing Commander(2x), Starheart Stonewall, Ace O'Goshen, Genius Bourbon King, Kalarama Rex(2x) and Beau Fortune. Lines to Supreme Sultan and Flight Time (by CH Wing Commander). Lines to CH Yorktown, CH Supreme Airs, Anacacho Denmark, Supreme Sultan (2x), and Kalarama Rex. Lines to CH Buck Rogers, CH Wing Commander and Status Symbol. bred by Fairwind Farms Inc.
Lines to Will Shriver, Anacacho Denmark, Stonewall Supreme, CH Wing Commander, and CH Yorktown(2x). Lines to Genius Bourbon King, Anacacho Denmark(2x), Stonewall Supreme(2x), and Gallant Guy O'Goshen. Lines to Mr. Magic Man, CH Yorktown, and Oman's Desdemona Denmark. OF Grand Champion Plantation Mare "Dixie Lady"
Lines to Wing's Fleet Admiral, Stonewall King(2x), CH King's Genius, and Wild Rex. OF Grand Champion Dutch Warmblood Stallion "Escapade"
Lines to CH Yorktown, Status Symbol, Beau Fortune, Supreme Sultan, CH America Beautiful, Kalarama Rex and CH Anacacho Shamrock. Lines to Kalarama Rex, CH King's Genius, CH Sky Watch and Society Rex. Lines to CH Valley View Supreme(2x), CH Wing Commander, CH Courageous Admiral, CH Dream Waltz, and CH Ridgefield's Genius. Lines to CH Wing Commander, Stonewall King(4x), CH King's Genius(2x), Mountain Peavine.Wing's Fleet Admiral, and Wild Rex. Lines to CH Wing Commander(3x), Mr. Magic Man, CH Supreme Airs, Supreme Sultan and Kalarama Denmark. Lines to CH Valley View Supreme(2x), CH Superior Odds, CH Wing Commander, Genius Bourbon King and Stonewall King(2x). Lines to CH Wing Commander(2x), Denmark's Bourbon Genius(2x), and Society Rex. Lines to CH Valley View Supreme(2x), CH Dream Waltz, Denmark's Bourbon Genius and Stonewall King. Lines to CH Wing Commander, Stonewall King(2x), CH King's Genius, Supreme Sultan, CH American Beautiful and Anacacho Denmark. Lines to CH Sky Watch, CH Buck Rogers, and Winter Carnival.